Precious metals futures sank Friday after the U.S. dollar rallied Thursday against the euro. Gold finished at its lowest price of the year after hitting a one-month high. Gold for August delivery plunged $29.80, or 2.3%, to settle at $1,278.50 an ounce on the Comex division of the New York Mercantile Exchange. The settlement is the lowest since Dec. 21 when the yellow metal ended at $1,270.60 an ounce. 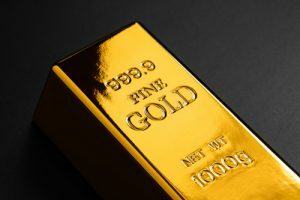 Gold’s "inability to hold above the $1,307 resistance level and the subsequent breakdown below the psychologically-important level of $1,300 has led to follow-up technical selling," MarketWatch quoted Fawad Razaqzada, technical analyst at Forex.com. "The breakdown undoubtedly triggered a cluster of stop sell orders which exacerbated the breakdown." Gold futures traded 1.9% lower this week after rising 0.3% last week. On Thursday, gold closed at $1,308.30 an ounce — its best settlement since May 14. Prices are now 2.4% lower on the year to date. "Sixteen market professionals took part in the survey. There were 10 votes, or 63%, calling for gold prices to rise. There were four votes, or 25%, calling for gold to fall, while two voters, or 13%, look for a sideways market. Meanwhile, 1,081 voters responded in an online Main Street survey. A total of 683 respondents, or 63%, predicted that gold prices would be higher in a week. Another 306 voters, or 28%, said gold will fall, while 95, or 8%, see a sideways market." Silver for July delivery tumbled 78.2 cents, or 4.5%, to settle at $16.48 an ounce. Silver futures traded 1.6% lower this week after gaining 1.8% last week. The precious metal is 3.9% lower on the year so far. July platinum declined $23.10, or 2.5%, to $887.80 an ounce, for a 2% weekly loss. Palladium for September delivery fell $24.80, or 2.5%, to $981.80 an ounce, for a 2.4% weekly loss. The pair is lower on the year to date with losses of 5.4% for platinum and 7.5% for palladium. Gold fell $17.50, or 1.3%, to $1,285.25 an ounce. Silver rose a dime, or 0.6%, to $17.225 an ounce. Platinum declined $11, or 1.2%, to $898 an ounce. Palladium fell $15, or 1.5%, to $995 an ounce. In LBMA results for the week, silver gained 3% while the others logged losses reaching 1% for gold, 0.3% for platinum, and 2% for palladium. Gold bullion coins rose by 6,500 ounces this week after they advanced by 11,000 ounces last week. All sales this week came from American Gold Eagles. Last week, splits included 6,000 ounces in American Gold Eagles and 5,000 ounces in American Gold Buffalos. American Silver Eagle sales climbed by 25,000 this week after rising by 100,000 last week. Sales of five-ounce silver bullion coins were muted for an eighth week in a row. CoinNews will take a second one-week break in publishing bullion articles.